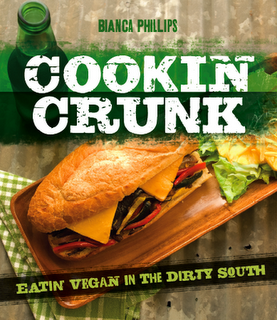 Vegan Crunk: St. Patty's Day Eats! I totally nerd out for holidays (and if you're a regular blog reader, you probably already know that! ), and St. Patrick's Day is no exception. I wear green. 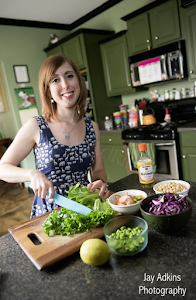 I eat green foods and/or Irish-inspired meals. I start the day with liquor-spiked coffee. I go to bars. I do pub runs. I fully embrace all aspects of the holiday. In fact, I'd say St. Patrick's Day falls in my top five fave holidays. This year, my celebration started the night before! On St. Patrick's Day Eve, Misti and I had plans to do the Breakaway Running St. Patrick's Day Pub Run, which is exactly what it sounds like. You run from the running shop to a bar, drink, run to another bar, drink, run to another bar, drink, and run back to the running store. It started at 6 p.m., right after work, so rather than eat a heavy dinner, I had a quick Chocolate Chip Mint Protein Smoothie with fresh mint, almond milk, banana, Nutiva chocolate protein powder, and chocolate chips. Then I met Misti at Breakaway, where we changed into our free pub run shirts (top left). We ran from there to Memphis Made Brewing Co. (top right), where we had some small 10-ounce beers (Plaid Attack Scotch Ale for me). Next stop was Hammer & Ale (bottom left), where I had a Terrapin Mosaic IPA. And our final stop was Slider Inn (bottom right), where I ordered a Memphis Made Firewide Ale. 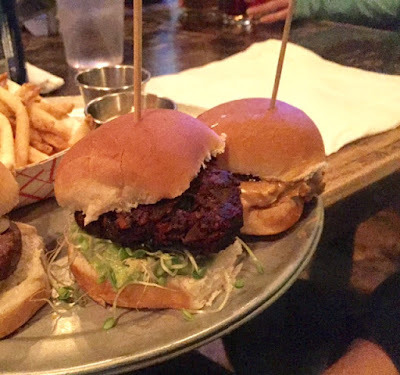 By the time we made it to Slider, we were pretty hungry, so we split a plate of sliders and fries. Misti ordered a meat slider, and I had a Vegan Triple B (beet, brown rice, & black bean burger with avocado and sprouts). We split a Nuts & Berries (PB&J) slider and an order of fries. 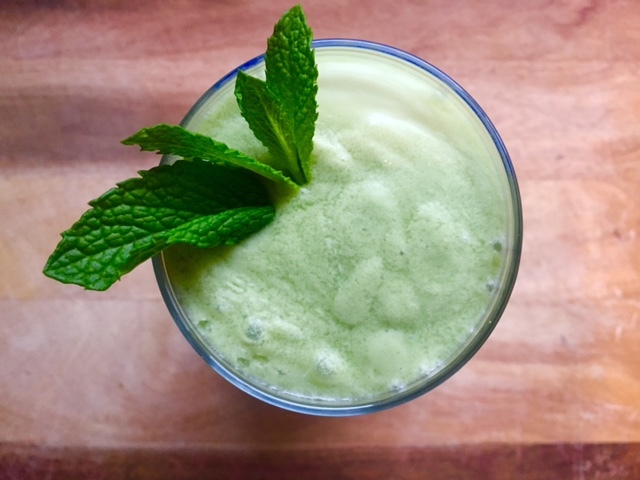 The next morning, on St. Patrick's Day, I started with another minty smoothie! The Shamrockin' Shake from The Superfun Times Vegan Holiday Cookbook has a base of avocado and coconut milk (from a can), so it's super-thick and creamy. I think it's actually supposed to be a dessert, but it's healthy enough for breakfast. It's loaded with fresh mint and sweetened with agave. 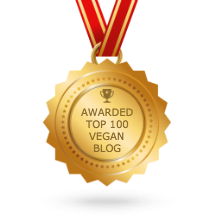 A few days prior, I'd made some Vegan Irish Cream from Joni's Vegan Good Gifts cookbook. I make it every year for spiking my morning coffee. There's only a small amount of Jameson in the whole recipe, so don't worry — it's not potent enough to cause a buzz before work! My lunch was also from The Superfun Times — Herbed Couscous Salad with Green Apple & Pine Nuts. The homemade dressing was a beautiful shade of green and was filled with lots of fresh herbs — basil, parsley, and thyme — and bright lemon. The recipe called for baby kale, but unless it's massaged to death, I'm not really into baby kale. So I subbed out baby spinach instead. This tasted like spring! Dinner was a more Irish-inspired meal, also from The Superfun Times. I made the Pepperoni Potato Stew with Kale. Now, I know pepperoni isn't Irish, but what's more Irish than potatoes? And the kale is there for a little green. That pepperoni was created using the seitan steamer method — where you make seitan dough, season it with spices and herbs (in this case, I used fennel for a pepperoni taste), wrap in logs with foil, and steam for 40 minutes. Then it was sliced and added to the stew. You can't have stew without bread, but The Superfun Times doesn't have a St. Pat's bread recipe. 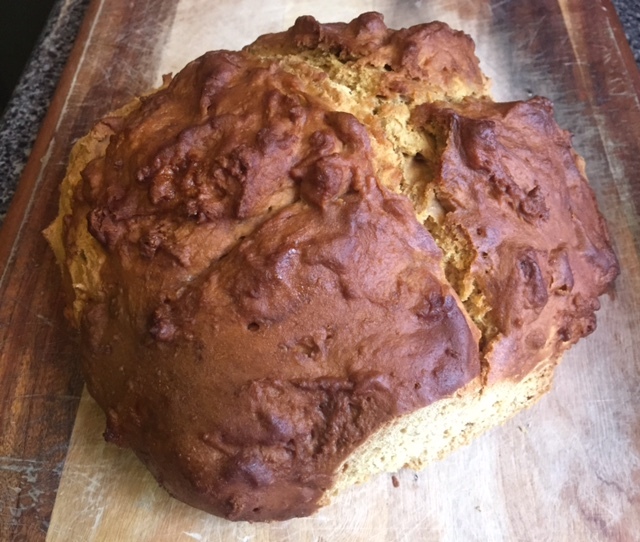 So I made my old standard — the Irish Soda Bread from Celebrate Vegan. I've made this hassle-free quick bread for St. Pat's many times, and it never disappoints. It's dense and hearty with just a hint of sweetness. Perfect with vegan butter. After dinner, my friend Andy came over and we did some car bombs (I know this isn't PC, but I don't know what else to call them, sorry) using this amazing chocolate coconut Irish potrter by Oskar Blues and the vegan Irish cream I made. I love car bombs SO MUCH. Something about that sweet cream and the thick, cold beer! Mmmmm. 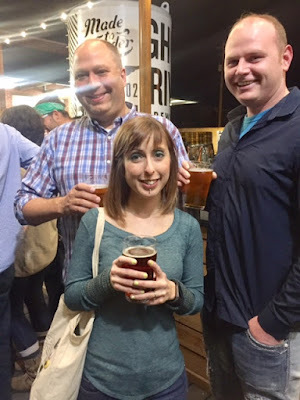 We went from my place to Ghost River Brewing, where we met up with our friend Wes. And Simon and Jennifer. Ghost River was offering $1 off their Riverbank Red Irish Ale for those who wore green. As you can see above, Andy and Wes FAILED at wearing green. Ugh. Later, we ended up at Dru's Place — our favorite gay karaoke bar! Cheers! My friend Shara joined us there too! Fun night! Hope y'all had a lovely St. Pat's too! That salad is so beautiful! I love Maynard's one ear up and one ear down, too cute!! I also used baby spinach and my salad rather than baby kale. I couldn't find baby kale, but that was OK because I prefer spinach in salads anyway. I love love love that you're a nerd for the holidays because I am too! My mom made us some Irish coffee this past weekend, and it was my first time ever having any. Whoa, so dangerously good! Snow Monkey Superfood Ice Treat! Peachy Green Protein Ice Cream + Oats! Mama Gaia Opens in Crosstown! 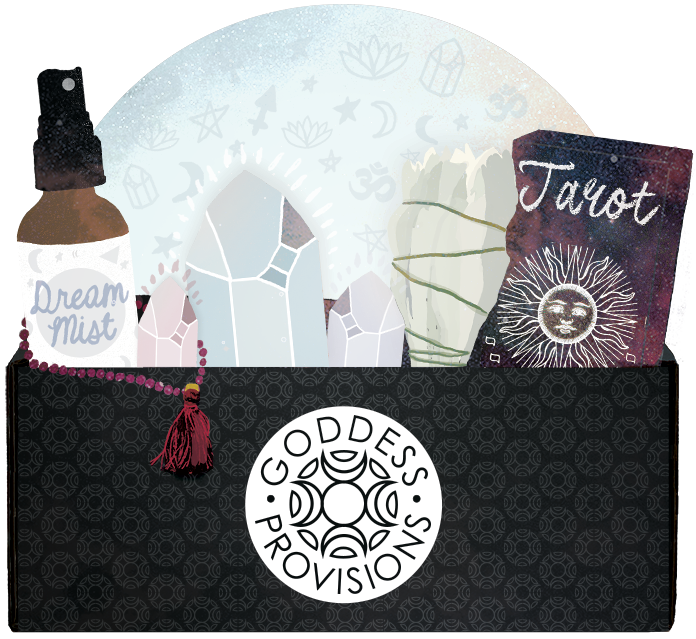 Mermaid Magic Box from Goddess Provisions! Little Rock Marathon Race Recap!